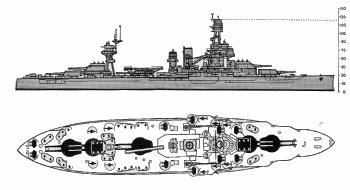 Dimensions 573'2" by 106"4" by 31'6"
1942-8: Added 4x4 1.1" guns and 42 20mm Oerlikon AA guns. 1943-4 to 1943-10: All 1.1" guns replaced with quad 40mm Bofors AA guns. Late 1944: Light antiaircraft is 10x4 40mm and 44x1, 1x2 20mm guns. The New Yorks were among the oldest U.S. battleships still in commission. They were based on the Wyoming class, but with 14" (356mm) main armament and slightly thicker armor. Built in 1914, before the all-or-nothing armor revolution, they were modernized to bring their protection to 40% of displacement, with adequate deck armor. They lacked range and stability, suffered from unreliable machinery, and were poor sea boats. 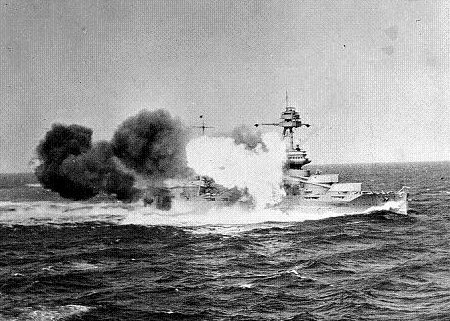 However, they gave useful service in the European theater, and the New York herself joined the Pacific Fleet just in time to be slightly damaged by a kamikaze. New York also served as a test platform for early naval radars, so that she began the war with CXAM already installed.